Ellie Torres, candidate for Hidalgo County Commissioner Precinct 4, at the Edinburg Annex building location Tuesday March, 6, 2018 in Edinburg. EDINBURG — Challenger Ellie Torres narrowly defeated incumbent Joseph Palacios in a tight race for Hidalgo County Precinct 4 Commissioner on Tuesday night. Torres, an Edinburg school board trustee, led by 141 votes during the early voting period and became the apparent winner of Tuesday’s primary. She obtained about 52 percent of the vote with 7,973 ballots cast in her favor. Palacios, who has been in office for seven years and lost by more than 500 votes, obtained about 48 percent with 7,433 votes in his favor. Torres thanked her supporters and said she would continue to work just as hard as she did on the campaign trail. “If I’ve been able to rise, it’s only because I stood on the shoulders of these giants that lifted me,” she said. The battle between Palacios and Torres was reminiscent of the power struggle in Edinburg last year, when those aligned with Torres — Edinburg Mayor Richard Molina and her husband, Edinburg Councilman David Torres — were able to unseat the previous Edinburg leadership led by former Mayor Richard Garcia. The move was widely seen as an attempt to undermine the political strength of the Palacios family, which has strong ties in the local arena. Tuesday’s election results indicate Torres was able to ride the momentum and secure the seat. 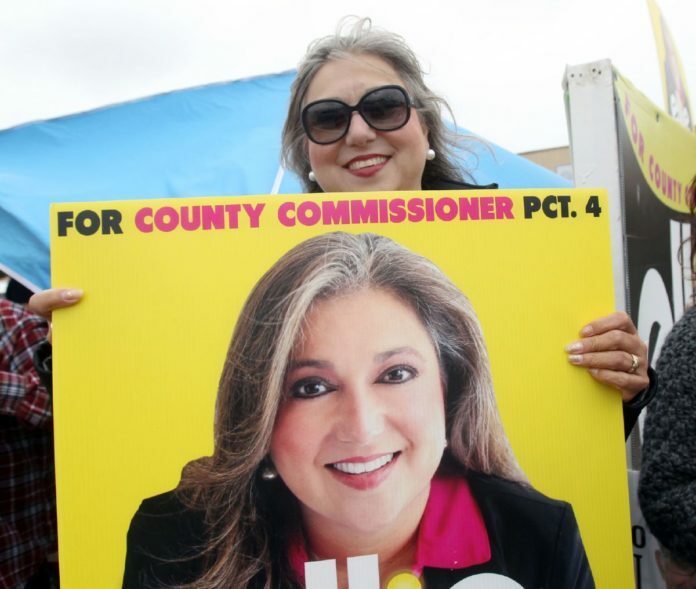 “There’s opportunities every day, and I knew it required a lot of work and I’m ready to continue to do the work as Hidalgo County commissioner,” Torres said. The race raged on Tuesday as dozens of voters poured into the Elections Annex in Edinburg to cast their ballots. Both candidates spent a majority of their time campaigning outside the polling location, which is essentially known as ground zero because the site draws the most voters throughout the county. During early voting, more than 7,300 people voted there. Their camps faced off against each other as they encouraged voters walking in or driving by to support their nominee of choice. Torres’ team called her “a breath of fresh air,” while Palacios’ supporters asked voters for four more years.